An intense week, and one of preparing for change, as our Chairman David Hypher will stand down at our Trustees meeting next Tuesday. The Team took David and Pam out to lunch at The Stag at Eashing by way of a "thank you " to David in particular. Our Chairman designate Lesley Myles MBE,JP,DL will take over on Tuesday , and a smooth transition will have been achieved. Similarly the arrangements for advertising /recruiting to my post are all sorted too- the ad will go out in March, and interviews fixed for 8 April. I will NOT be playing any part in the process...a CEO for the future , not the present or the past! Went to Therfield School, Leatherhead Careers evening on Tuesday with Tasha (Workforce development and HR) , and it was an excellent evening not just in talking to parents and young people , but in being able to pitch the CTV product from our Surrey Youth Enterprise company to the Met Police at an adjoining stand. Closely involved in working with the commissioners putting Childrens social services out to contract, and also Mental health(CAMHS) re-commissioning out to tender. Invitations to tender go live in the summer. All part of our "Leading , representing, and advocacy" role., and in regard to this we are being invited to represent the sector on the top level, and very important Surrey Children and Young People's Partnership Strategy Group, about which more another time. Kate ran a successful funding advice workshop on Tuesday attended by 30 people, and the next "How to set up in Business " aimed at young people is now also fully booked. Our lawyer is working in setting up our second social enterprise to take over the Woking Youth Arts Centre (aka Trinity Studios, where the Spice Girls first rehearsed/recorded), and we have a second major sponsor for CommUniLAB , so although we are all very busy things are going very well. It has been a week in which I have concentrated on internal matters in the main….sorting job profiles and making sure all internal issues are out of the way as we build up to re-submitting ourselves for Pqasso Level 2 assessment. I’ve also been advising on the process and job profile for my successor – I retire at the end of August. It’s a rather strange feeling doing this, but we have nearly got the recruitment process and timetable sorted. I will NOT be involved in the selection at all once the process is launched. We also had an important Management and Finance meeting on Monday when it was decided to proceed with setting up our second social enterprise…in this case to take over the property management of Woking Youth Arts Centre. The WYAC is the home base of Peer Productions, a member organisation. We now have to move fast to set up the Community interest Company(CiC) to run the WYAC. The building is also known as Trinity Studios, and really is the place where The Spice Girls first rehearsed and recorded. Met with colleagues from Barclays SE Regional Office on Tuesday about CommUniLAB ( Barclays are our main Sponsors) and their input to our workshops (funded by Wates) on “How To set up in business”. All very positive. I’m delighted to have appointed our CommUnilab project manager who will join us on 24 Feb. and she will put some serious wellie behind the project. More details next week. Meeting with Surrey CC’s Director of Children and Families this afternoon about how his Directorate might work more closely with the voluntary youth sector, which will be useful. Traffic in/out of Guildford has been really bad this week, but it is getting lighter in the mornings, and I too am getting lighter- essential for long distance walking! Intensely busy week and long hours, but good progress being made on all fronts. Interviewing this afternoon to appoint a CommUniLAB project manager and have very able candidates which is excellent. We have compiled our Draft Budget for next year(2014/15) which will just about balance exactly on Income/Expenditure, so long as various assumptions are delivered upon. It will be fine. Very important meeting with Surrey CC’s Youth Services commissioners on Tuesday to discuss various matters pertaining to the future of the current contracts – centre based youth work and prevention grants. I had drafted an 8 page paper as input to the meeting and there was a considerable congruence between the views expressed by both parties – I think the Consortium and the SSCC commissioners see the future in the same way…..innovation being essential. Sorry – bit Delphic, but this was a private meeting. Also have a Consortium Board meeting this morning when I am presenting on business development including the possibility of a Erasmus + (EU) bid. We had a great meeting on Monday with the Deputy Police and Crime Commissioner at our Surrey Youth Enterprise in Leatherhead. The enterprise is growing fast..we’re interviewing to recruit more apprentices shortly. The Commissioner was very impressed with our world class intelligent CCTV product, which we will now be pitching to Surrey/Sussex Police directly, thanks to his help. There is every prospect now of us setting up a second social enterprise to undertake the property management of Woking Youth Arts Centre. I have had several discussions about this and I think we have the basis for making progress, but we will have to move fast to set up the social enterprise, find directors, appoint a building manager, get some maintenance works done..all by 1 April. This will be a GO/NO GO decision by a sub – committee of the Board; I hope we proceed – slightly risky but you have to do so to move on…and stasis is not possible. Went to a wonderful public lecture on Wednesday evening about Thomas Merton given by Prof Michael Higgins, his biographer and editor of 3,500 letters, BUT Higgins is also the official biographer of the equally wonderful spiritual writer Henri Nouwen, and editing his 19,000 letters…wonderful scholarship. I’m doing my first training walk of 2014 tomorrow..in the rain I think…2 hours out..2 hours back..12 miles on the Sussex Downs..Ok not roadrunning but walking..fast. Soon be 6 Nations (rugby) too!! Well it doesn't take long before turbulence is experienced. The Chancellor announces more cuts beyond the general Election in May 2015, and those already in place have a real impact. Regular readers will know we have links to our former sister organisation in West Sussex and have some legacy funding to support their voluntary youth sector members. I met with WSCVYS former CEO yesterday to plan various workshops in West Sussex, so I keep tabs on what is happening there.....This includes £61 mill cuts on a £600 mill budget and £1.2 mill off the Youth Service, and the cutting of WSCC's Chief Executive, and his post completely. Meanwhile the Cabinet Office is promoting an initiative with local authorities called Delivering Differently aimed at encouraging local authorities to put services out to Mutuals, social enterprises or Local Authority Traded Companies.The familiar distinctions between the public, private and charity sector continue to be blurred which seems inevitable, but this MUST be balanced by an increase in the powers of Select C’tees, and Audit in both Central and Local government. The risk is that without such a check and balance we will see a complete loss of public accountability, because the chain from politician to commissioning public servant, to prime contractor/LATC/mutual, to sub-contractor, to sub-sub- contractor is so long, and complex that accountability will be lost. The result will be malpractice at best, and corruption at worst. The recent example of Serco being in trouble with the Ministry of Justice about various malpractices is the sort of episode I have in mind. More prosaically, my week has been about catching up with various internal matters including a staff-time cost recording system against projects, and shaping up our Pqqasso Level 2 bid. 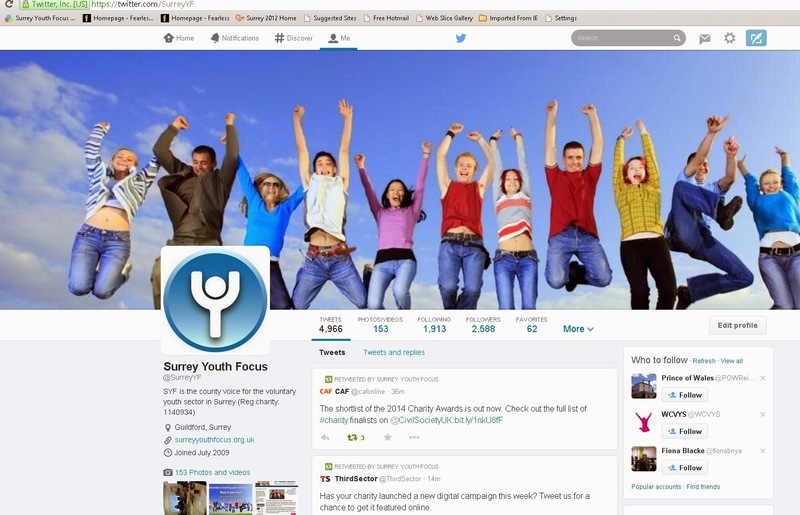 Also pushing hard to get the deal done on Surrey Youth Focus taking over the property management of Woking Youth Arts centre , and doing so through setting up another social enterprise to handle it.Today is the closing date for applications for our CommUniLAB project manager post - very encouraging response thus far. Just re-reading Thomas Merton's autobiograhy - "Seven Storey Mountain " - he being one of the two greatest spiritual writers of the 20th century - as I'm going to a very distinguished public lecture about Merton next week. As Assistant England Rugby Manager I am pleased with the new squad just announced..but not with the performance of Manchester United! Just signed up for yoga classes - "strengthening core" etc . With Christmas and New Year celebrations over, we all turn inevitably to prospects for 2014, and this should be an exciting year for SYF. Our current and wonderful Chairman , David Hypher will be standing down on 4 February ...to be succeeded by any equally wonderful new Chairman Designate, Lesley Myles. The three of us are working closely together to ensure a smooth transition. The CommUniLAB project manager post is currently advertised (see website) . Closing date 10 January and there is every prospect of making an a very good appointment, which will bring us to six staff. I met with our charity lawyer before Christmas to discuss the form of social enterprise to undertake the property management of Woking Youth Arts Centre, which I need to get done in short order so that we can take up the running of the centre from 1 April. Good luck to Daisy Chater who starts work as our first Apprentice with Surrey Youth Enterprise CiC in Leatherhead on Monday! Delighted to have won some funding from the Police and Crime Commissioner for The Youth Consortium to train up their staff (through Yes +) in the early identification of behavioral issues that could lead to criminality.A key task today is to progress further grant bids for the Consortium, and also to complete an innovative paper about the future management of the youth centres that is to be the subject of a workshop with Surrey CC on 14 January. Looking further forward, the process for recruiting a new CEO is being put in place, and involves the ad. being out in March, and interviews in early April. I will not be playing any part in the interview process -it's about the right person for the future, not the present or the past. From my point of view the key date is Friday 29 August, and the need to prepare from my 500 mile Camino Santiago walk starting on Monday 15 Sept....then the book(which I have started) ...then the social enterprise...so exciting times in all respects!